The Florida Museum’s Paleobotanical Collection includes approximately 250,000 specimens. This is a conservative estimate that does not take into account the fact that an individual hand sample may contain more than one fossil of interest. In addition, the facility houses the John W. Hall paleobotanical collection (approximately 20,000 specimens) transferred from the University of Minnesota. 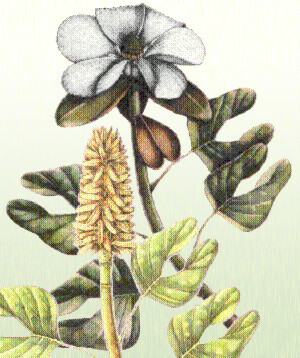 Illustration of Archaeanthus, a 100 million year old angiosperm. The online collection database contains more than 70,000 digitized records of the collection. Systematically the greatest strength of the collection is in Cretaceous-Tertiary angiosperms, which are represented by large numbers of well-preserved fruits and flowers as well as leaves and wood. 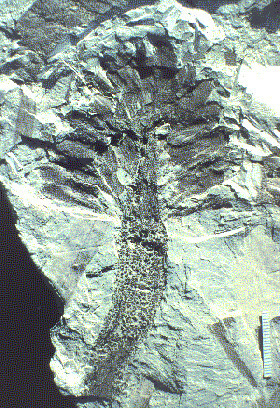 A majority of publications generated by the collection have dealt with angiosperm systematics, but publications also have been generated on algae, fungi, lycopods, ferns, seed ferns, conifers, and insect mines and have been used to address questions of phylogeny, paleogeography, and paleoclimate. Fossil of Archaeanthus, a 100 million year old angiosperm. The type collection includes all Florida Museum paleobotanical specimens that have been cited in published literature, extending from the 1890s to the present. More than 310 publications are known to have cited specimens that now reside in the Florida Museum’s paleobotanical collection (a list of these publications is available). There are currently more than 5,500 specimens, 1,500 thin section, cuticle, or pollen/spore slides and SEM stubs, 6,595 negatives and polaroid prints of SEM images of fern spores housed in twelve cabinets. Organization is by year of publication and in the order of citation presented in the publications. Modern reference collections for leaves (>6,200 specimens), fruits and seeds (>2,200 specimens), pollen (The DM & S Jarzen palynological collection with >6,824 slides), and wood (University of Florida Herbarium – FLAS,approximately 15,700 accessioned wood samples and 1,000 microscope slides) are also available for comparative studies.